Built overlooking Victoria’s Inner Harbor, the British Columbia Legislature Buildings form an impressive architectural and historical landmark within a few steps of downtown. When the provincial legislature outgrew its former home, the provincial government hosted an architectural competition to build the new legislative buildings. Francis Rattenbury, a then 25-year-old recent arrival from England, won with his three-building neo-baroque style plans, but construction didn’t go without its woes; the project soared beyond its original budget, but the new British Columbia Parliament Buildings did open their doors in 1898. The white marble, massive central dome, and lengthy façade combined to make an innovative and impressive monument for what, at the time, was a relatively young Canadian province. The building remains equally impressive, today, and a few new landmarks exist on its property. A statue of Queen Victoria stands on the front yard, while a figure of George Vancouver sits atop the central dome. There is also a statue of a soldier to commemorate the province’s fallen heroes from WWI, WWII, and the Korean War. 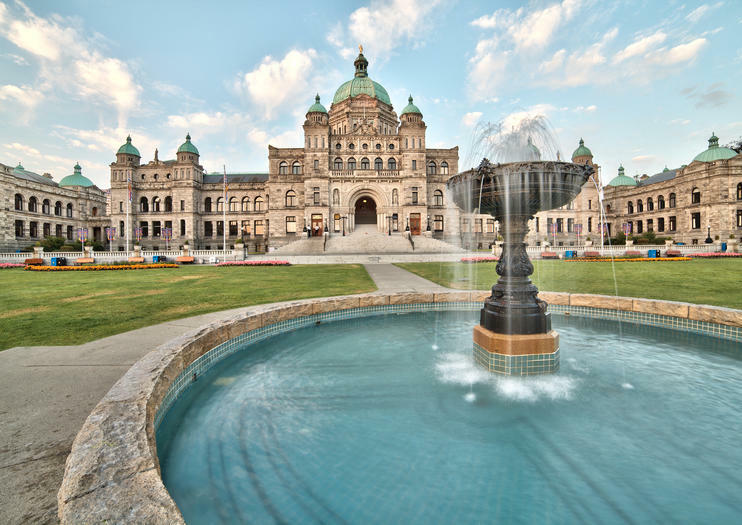 The British Columbia Legislature Buildings are located at 501 Belleville St in Victoria, B.C. Throughout the summer; they are open daily from 9am to 5pm. Throughout the winter, the buildings are closed on weekends. Visit the island city of Victoria on a full-day trip from Vancouver, and enjoy a day of exploring nature, history, and culture. You’ll have gorgeous views of the Georgia Strait on the ferry to Victoria, and then stroll the walkways at Butchart Gardens, tour elegant downtown architecture, and catch an evening boat back to the mainland. This trip to Victoria includes pickup and drop-off at your Vancouver hotel or port, admission tickets, and all transport for an easy-going day of discovery. Vantage Whistler has great reviews on TripAdvisor! Enjoy the scenic ferry ride from Vancouver to Victoria followed by a visit to famous Butchart Gardens, a 55 acre floral heaven. Get picked up from anywhere in Richmond, New Westminster, Burnaby, or Vancouver for a 13 hour private tour, which also include some free time to explore downtown Victoria. Ferry admission is included but Butchart Gardens admission is not.This is a private charter, so your group can decide how much time to spend on each location. Our guides are experienced and can show you around the city. Add some to elegance to your British Columbia vacation with a private custom tour of Victoria. Your personal driver will help you design a splendid itinerary, taking you through neighborhoods dripping with old-world charm and to the city’s many green spaces—including the famous Butchart Gardens. Forget the crowded tour bus and travel at your own pace, request stops to snap photos, buy a cup of tea or have a closer look at a site. Capital of British Columbia, Vancouver lies on the southern shores of Vancouver Island—with striking architecture, pretty parks, and a British colonial history dating back to the Victorian era. On this tour, explore Victoria in comfort by traditional horse-drawn carriage as your guide brings the city’s Victorian past to life. Along the way, discover sites of interest such as Beacon Hill Park, historic James Bay, and the Salish Sea waterfront. Get a new perspective on Victoria’s beautiful, bustling harbor on a guided 3-hour kayak tour. Glide through the historic waterways in a state-of-the-art sea kayak, soaking up fantastic views of where Victoria’s stately skyline meets the harbor’s wild aquatic landscape. As you paddle, join the local traffic of seaplane, ferries and whale-watching boats, and keep an eye out for native wildlife like river otters and harbor seals. Enjoy a romantic ride with that special someone, or a fun excursion with family and friends as you visit Victoria’s Beacon Hill Park in a horse-drawn carriage. Beacon Hill Park is one of Victoria’s main attractions, home to a petting zoo, playground and splash park, and the tallest totem pole in the world. Learn all about it from your guide as you revel in the beauty of the park. Discover the craze of SUP and enjoy fine views over Victoria’s famous skyline on this 3-hour Victoria Harbour stand-up paddleboard tour. Explore the channels of Victoria Harbour, where ferries, seaplanes, whale-watching boats and fishing vessels come and go daily. Delve into the Inner Harbour and the Gorge Waterway with your guide. Watch the waves for native otters and seals, and keep your eyes on the skies for soaring eagles and cormorants. Admire local attractions including the Fairmont Empress Hotel, the BC Parliament Buildings and Tillicum Bridge from the water. Travel to Victoria by private tour from Vancouver with included round-trip transport and an admission ticket to one of the city’s most famous attractions, Butchart Gardens. During your ferry ride from Vancouver, enjoy views of the Strait of Georgia. Plus, make a stop at Victoria Harbour, and go on a tour of the British Columbia Parliament Buildings.